New Year’s Eve is two nights away and you still don’t have a party theme? Going to a party and unsure what to bring the host? How about wine and cheese pairings? It might sound intimidating, but we’ve simplified the process for learning how to match wines with cheeses to complement their flavors. We started with cheese that you probably already have in your refrigerator: sharp yellow cheddar, Muenster, mozzarella (string cheese, actually!) and a block of Parmesan. In terms of nutrition, cheese is well known as a great source of calcium, which is a mineral linked with a variety of health benefits (lowering blood pressure, strengthening bones, and aiding in weight management). One ounce of cheddar or Swiss contains over 200 mg of calcium – and adult men and women need 1,000 – 1,200 mg/day. The calcium, fat and calorie content of cheese depend on the variety. In general, hard cheeses tend to contain more calcium. Parmesan – “You’re looking at wines that have more body, more flavor,” Christina advised. “Look for wines, some with more tannins, that can stand up to the bold, sharp cheese.” She suggested Barbera d’Asti Casata Monticello or a Grenache/syrah blend like the Chateau de Vaugelas Corbieres. Christina’s parting advice? “Think about the basic flavors and properties. 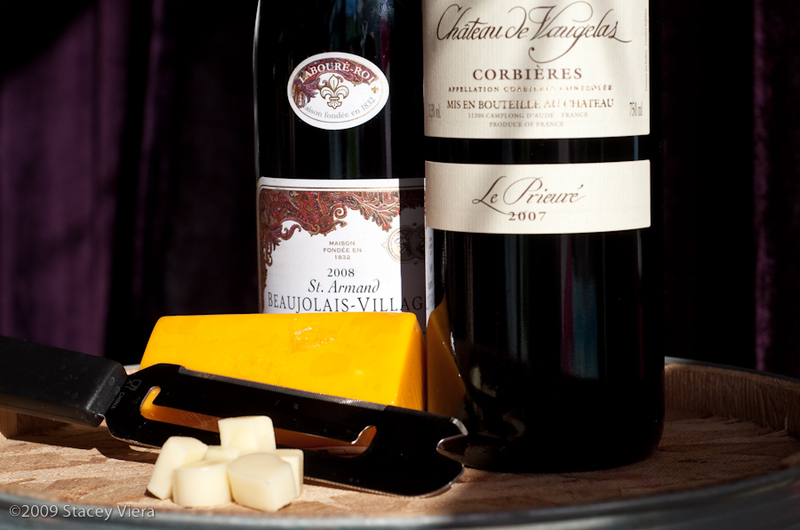 If cheese is strong or full, find a wine to match that.” Conversely, match a mild cheese with a softer wine. We hope that we’ve simplified the pairing process for you. Have you paired other wines with these cheeses? What advice can you share with readers? Have a safe and happy holiday! See you again in 2010! How Stacey Got the Shot: At Best Cellars, with mid-morning light coming in through the front windows. (Should’ve brought diffusion material.) ISO 200, f/5.6, 50mm focal length, 1/500 second exposure. Note: Bloggers were not compensated in any way by Best Cellars for this post. love love love love love todays photo !!!!!! I’d like to take a moment to recommend the best cheese in the world, Beemster XO, an aged gouda. It goes with everything short of breakfast cereals, and a little goes a long way. This is my favorite post on this blog so far … (probably because it gives me an excuse to keep drinking wine and eating cheese). Beautiful Photography! I absolutely adore a delectable glass of wine.. with of course cheese. Happy New Year!